The Metis Mons quadrangle (V6) in the northern hemisphere of Venus (lat 50° to 75° N., long 240° to 300° E.) includes a variety of coronae, large volcanoes, ridge and fracture (structure) belts, tesserae, impact craters, and other volcanic and structural features distributed within a plains setting, affording study of their detailed age relations and evolutionary development. Coronae in particular have magmatic, tectonic, and topographic signatures that indicate complex evolutionary histories. Previously, the geology of the map region has been described either in general or narrowly focused investigations. Based on Venera radar mapping, a 1:15,000,000-scale geologic map of part of the northern hemisphere of Venus included the V6 map region and identified larger features such as tesserae, smooth and hummocky plains materials, ridge belts, coronae, volcanoes, and impact craters but proposed little relative-age information. Global-scale mapping from Magellan data identified similar features and also determined their mean global ages with crater counts. However, the density of craters on Venus is too low for meaningful relative-age determinations at local to regional scales. Several of the coronae in the map area have been described using Venera data (Stofan and Head, 1990), while Crumpler and others (1992) compiled detailed identification and description of volcanic and tectonic features from Magellan data. 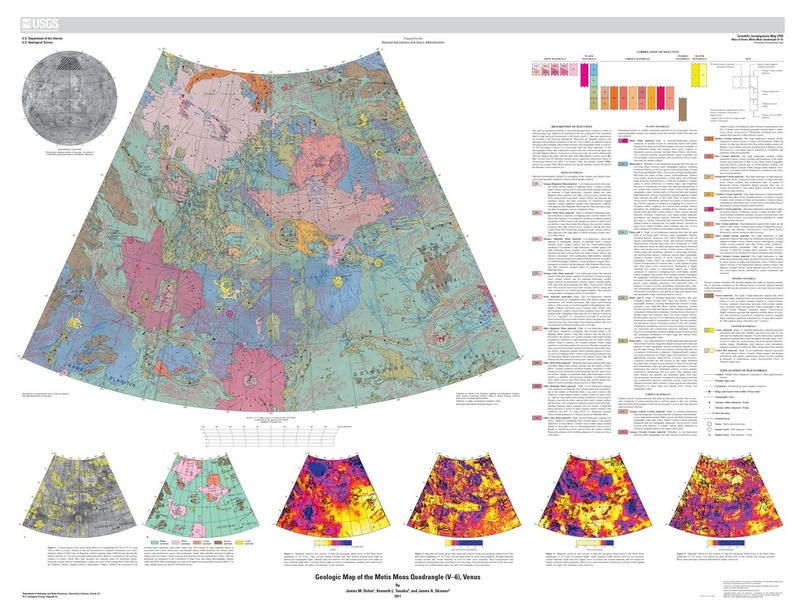 The main purpose of this map is to reconstruct the geologic history of the Metis Mons quadrangle at a level of detail commensurate with a scale of 1:5,000,000 using Magellan data. We interpret four partly overlapping stages of geologic activity, which collectively resulted in the formation of tesserae, coronae (oriented along structure belts), plains materials of varying ages, and four large volcanic constructs. Scattered impact craters, small shields and pancake-shaped domes, and isolated flows superpose the tectonically deformed materials and appear to be the most youthful materials in the map region.